You’ve been reading about some of our new Spring yarns in previous blog posts and our staff has been busily swatching them to find out what they’re like. We make a determined effort to provide you with knitted and crocheted examples of all of our yarns, either through samples or swatches. 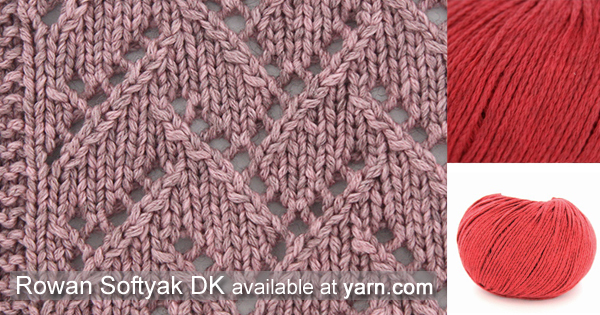 Often a yarn knits or crochets much differently than you’d imagine from its appearance in the skein. 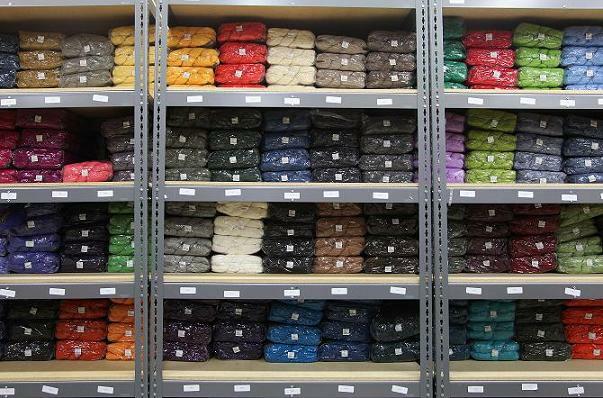 And all of our swatches are washed (which can change the yarn’s appearance even more) to provide an idea of how your garment or accessory will hold up according to its care instructions. This season, we present an array of weights and fibers! 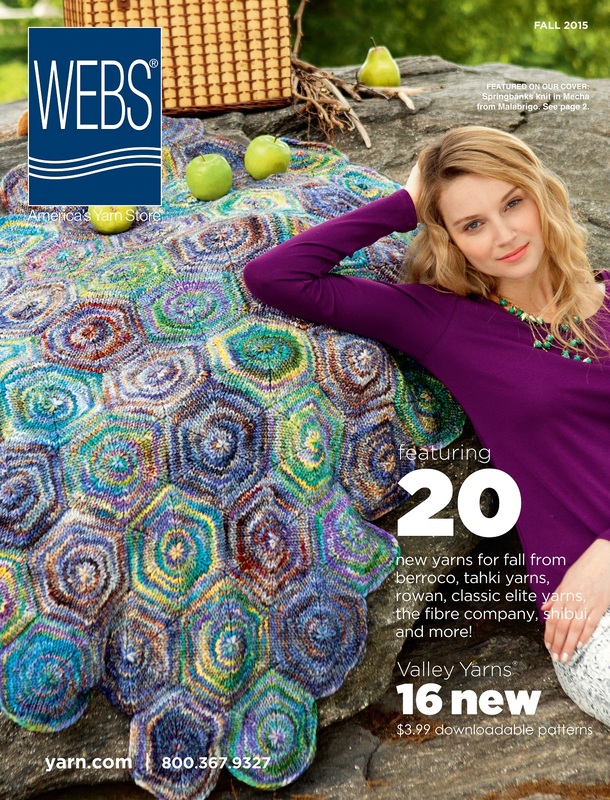 You’re bound to find a summer yarn that pleases you, even if you’re partial to animal fibers. The prize for most unusual fiber combination goes to Rowan’s Softyak DK, a blend of cotton, yak and nylon. Mary M. loved the chainette construction, and said the yarn has “excellent stitch definition,” making it “perfect for lace, cables or any other texture work. The yak transforms this summery yarn into a three season favorite.” Mary is thinking of using Softyak DK for one of the season’s popular t-shirts, tank tops or lightweight cardis. 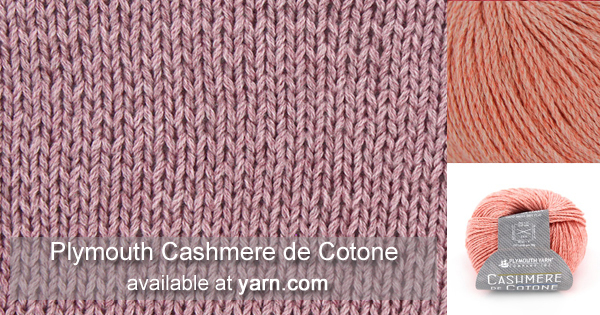 Marthe Y. experimented with two very different yarns. 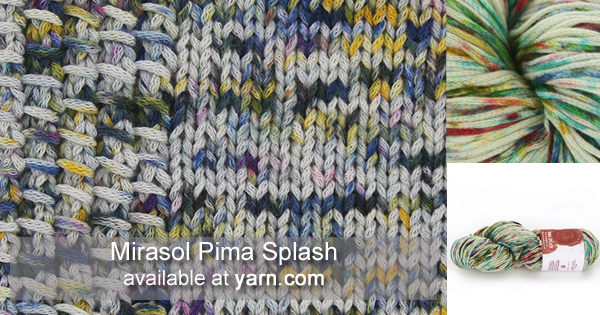 Pima Splash from Mirasol is a “terrific choice for summer garments such t-shirts, tanks and beach cover-ups.” A colorful, worsted weight cotton, the chainette construction creates a lighter, more flexible fabric than other cottons in its weight class. Marthe’s swatch is 4.5 stitches to the inch on a US 8 needles and she suggests working the yarn on a slighter bigger needle for loose, springy fabric. 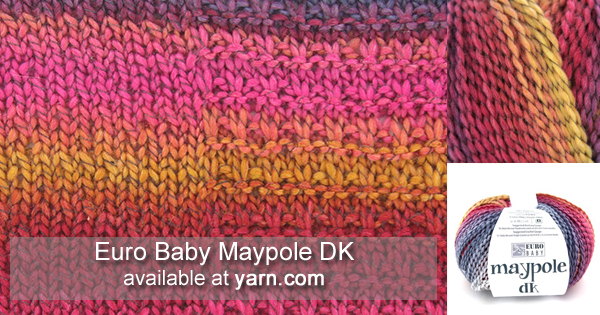 Marthe’s second swatch was knit in Euro Baby Maypole DK, a machine washable, 100% polyester yarn with a “self-striping effect, suitable for babies and children, due to its hypo-allergenic quality.” At 262 yards per skein, it wouldn’t take many balls to knit or crochet a baby blanket or child’s garment. 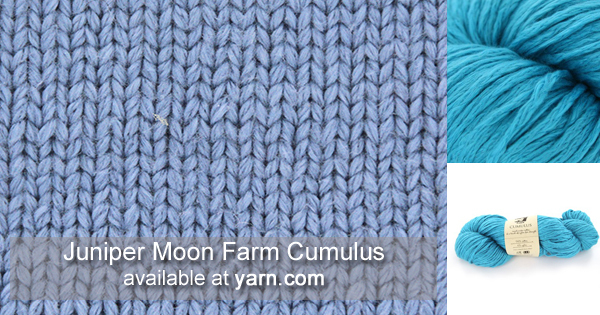 Beth D. opted for Juniper Moon Farm’s spring offering, Cumulus. 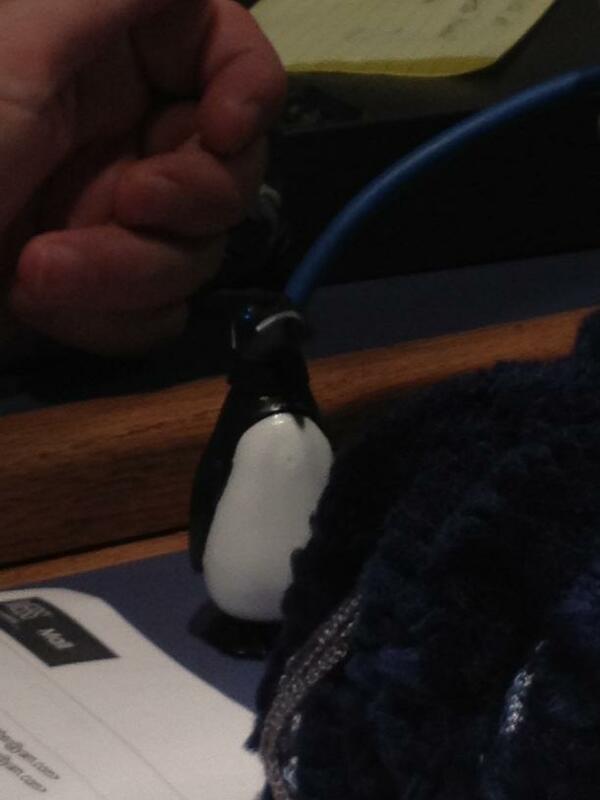 She states, “Cumulus is everything its name implies – soft and fluffy like a puffy, white cloud on a summer day! This 100% cotton yarn is perfect for a cool, lightweight tank or tee, and because it is a heavy worsted weight, it’ll knit up in no time.” The vibrant color palette provides lots of options for the perfect warm weather project. Although not a spring yarn, Malabrigo Rueca is a handspun dream. Beth says that “Rueca is a delight to knit with. In spite of the variations in yardage and gauge from skein to skein, its softness and stitch definition make this yarn a treat to use for a special gift or a little pick-me-up. 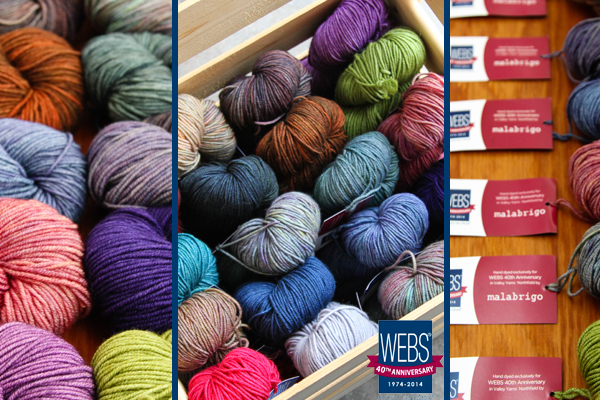 And…it is dyed in some of Malabrigo’s most luscious colorways. 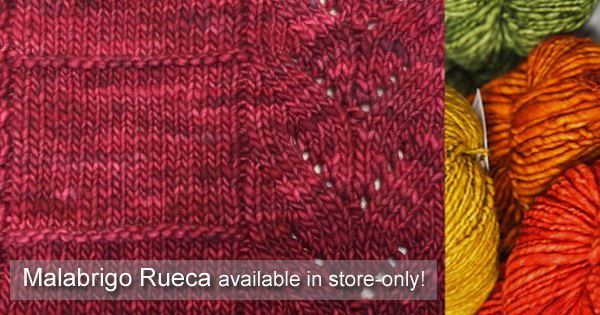 Rueca is only available in the store so you must come visit to experience it! As always, I invite you to spend a little time with us in Northampton this season. In addition to new seasonal yarns, we have an ever-changing variety of accessories, tools, buttons, patterns and sample garments to tempt you. 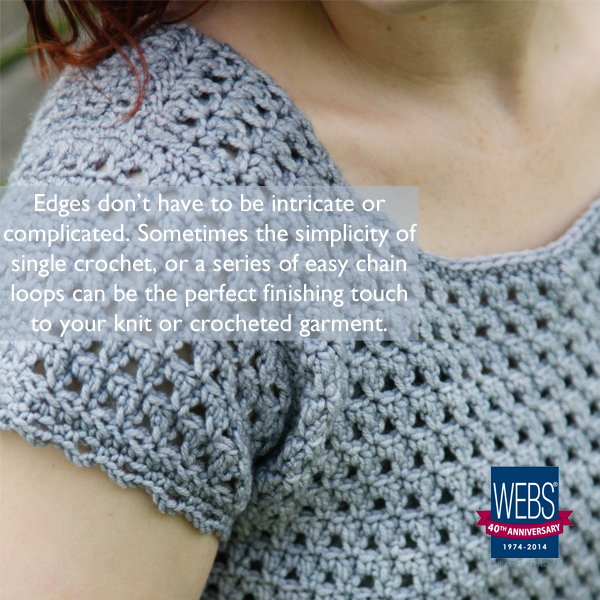 Let WEBS be your LYS, wherever you call home. Thank you for your continued support of, and loyalty to, our store. We wouldn’t be here without you! 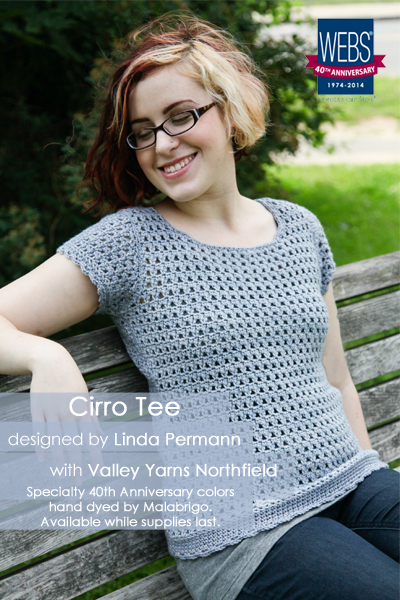 The Cirro Tee by Linda Permann is a simple yet gorgeous crocheted tee designed in Valley Yarns Northfield Hand Dyed by Malabrigo. 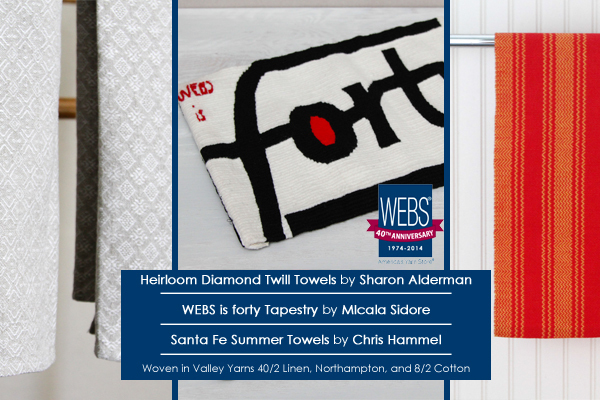 Everyone is looking for that perfect t-shirt pattern and this may just fit the bill! 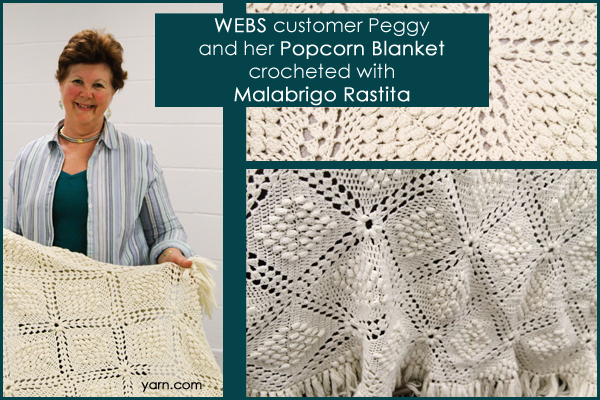 An easy to memorize two row pattern creates a textured and flexible fabric that results in a lightweight and very wearable crochet garment. The simple cap sleeves and understated waist shaping make this a flattering shapes for almost everyone. We love what Linda creates, too! Crochet your own Cirro Tee in our gorgeous Valley Yarns Northfield Hand Dyed by Malabrigo or try one of our solid colors of Northfield. As we sink into the dog days of summer it’s time to think about little projects that you can work on that won’t fill your lap with yarn. 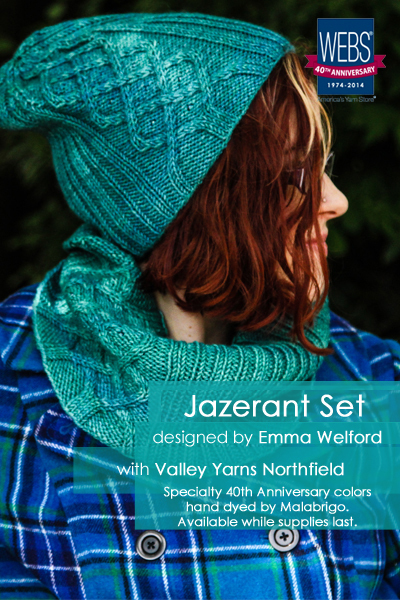 The Jazerant Set by Emma Welford is the perfect end of summer project. Knit in the gorgeous Valley Yarns Northfield hand dyed by Malabrigo these two small pieces have lots of great details to keep your knitting interesting without being daunting. 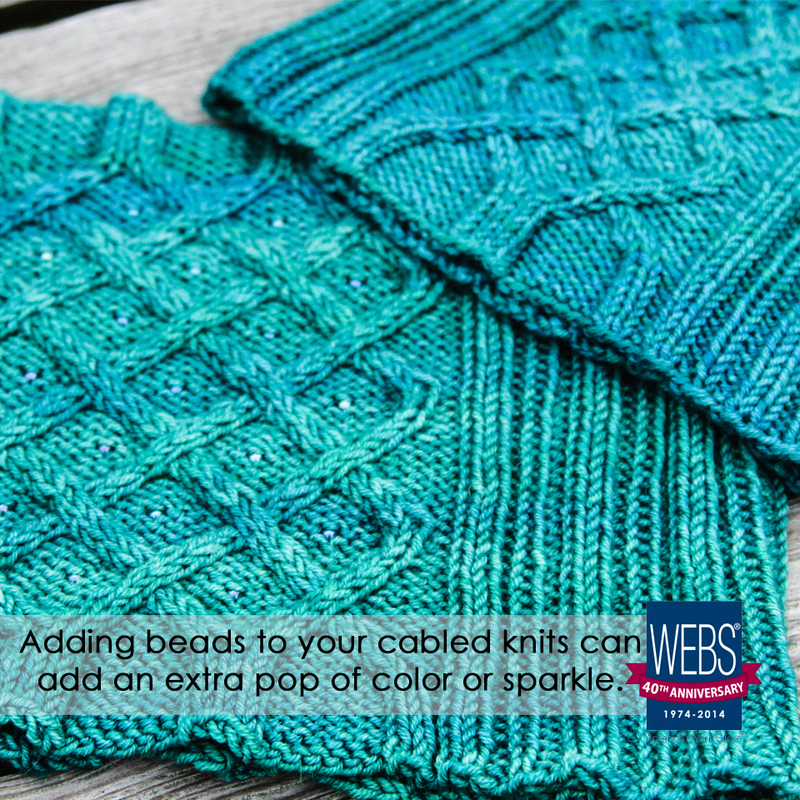 Non-symmetrical ribbing frames gorgeous winding cables which hide winking little beads! What’s not to love?! 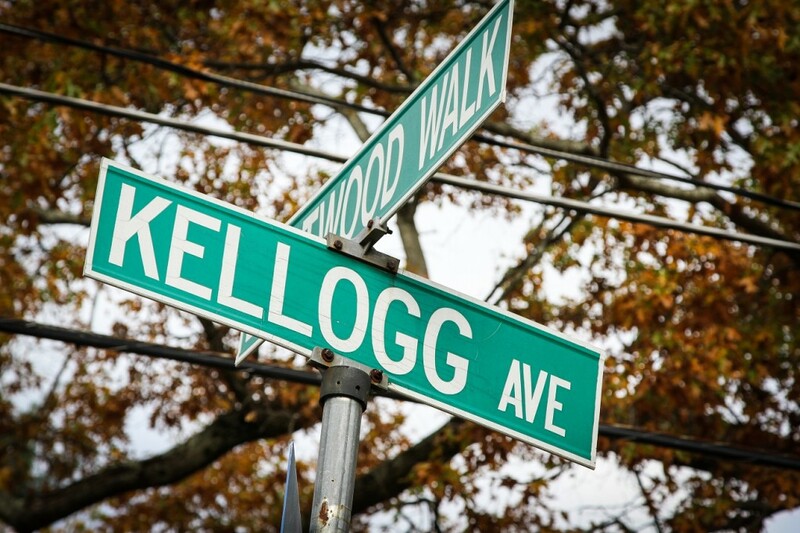 This week Steve talks with his parents, Art and Barbara, about WEBS’ transition from our Kellogg Ave. location in Amherst to our current location at 75 Service Center Rd. Northampton. In the early 90’s mail order was busy, their little parking lot was always full, and the shop was packed full of customers and yarns. They were bursting at the seams and there were warehouses full of yarn all over the valley. They talk about trying to find a larger location in Amherst and ultimately deciding to look in Northampton where they found our current building, which had been occupied by the Telephone company and housed their offices and their garage. And Art tells Steve how yarn.com came to be. Valley Yarns Northfield hand dyed by Malabrigo! – Limited Quantities so get them while you can! Convergence is next week in Providence RI, and hasn’t been in New England in over 20 years! Northampton Sidewalk Sale, July 24th – 27th – stop in the store for great deals and specials. – In store only. Join us for the Shibui Mix Yarn Party on July 29th from 6-7:30 pm – There is a $10 fee for this event, and space is limited so be sure to register today! July 30th from 10am – 3pm we’re hosting an American Red Cross Blood Drive at the store. Please sign up in advance, there is limited space available, but walk-ins will also be welcomed!Visit redcrossblood.org or call 1-800-RED CROSS today to schedule an appointment. 40th Anniversary Celebrations Round 3! Our Third Quarter of Specialty Anniversary products are available today! 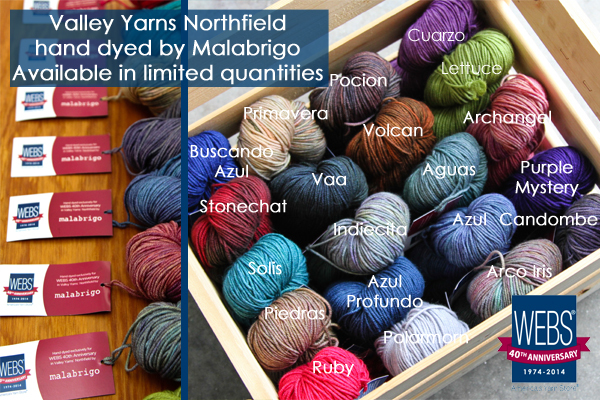 We’ve been eagerly anticipating telling you about our Valley Yarns Northfield hand dyed by Malabrigo! There are 20 incredible colorways including an exclusive Ruby colorway for our Anniversary. And we’re so excited about the designs for this quarter! 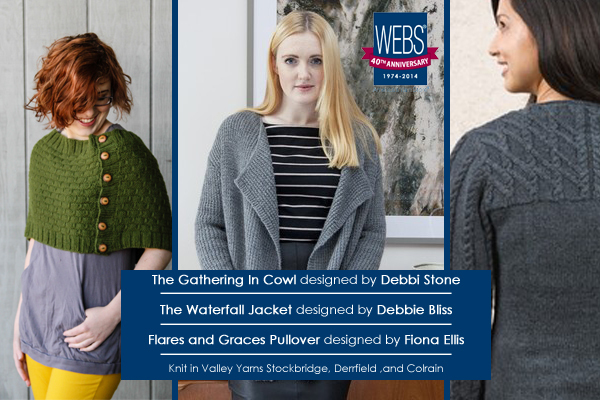 Our very own Emma Welford, who has modeled all of our Anniversary Garments this year, has designed the fantastic cabled and beaded Jazerant Set. 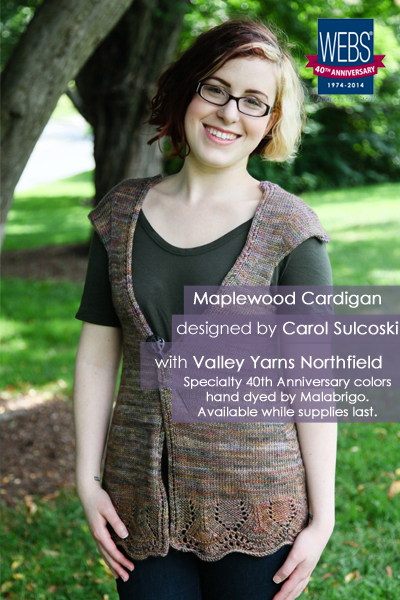 Carol Sulcoski designed the Maplewood Cardigan for us, an easy and comfortable layering piece with beautiful lace detailing at the hem. 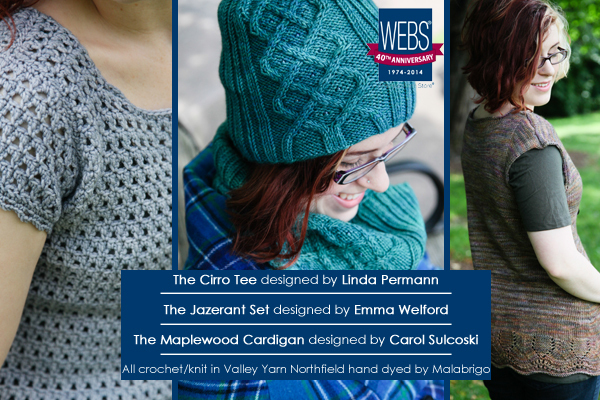 And Linda Permann may have designed the perfect crochet t-shirt with the Cirro Tee, a flexible and lightweight garment with an easy 2 row pattern repeat! 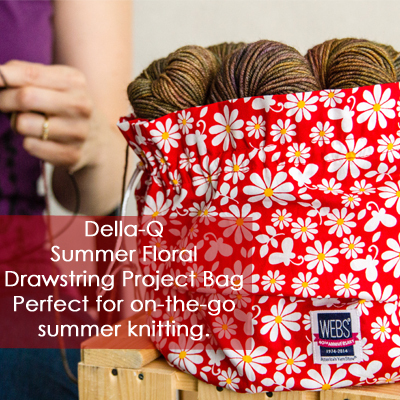 Della-Q has done it again with a bright summery print for her latest WEBS exclusive project bag. 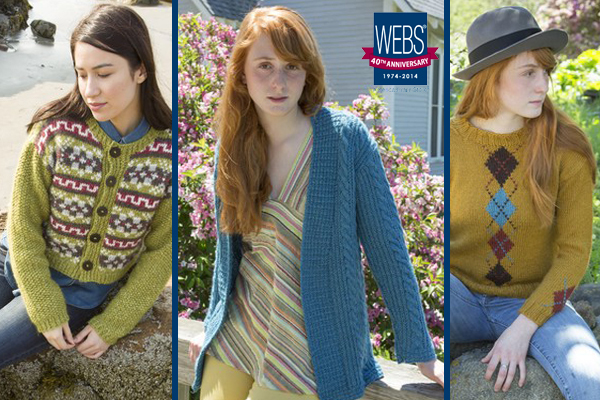 There will be three more weaving drafts from long-time friends of WEBS, as well as additional products and patterns. 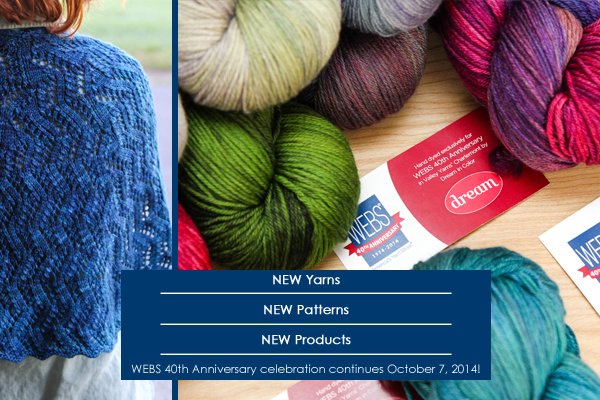 Follow us on Facebook, Twitter, Pinterest, Google +, Instagram, or on Ravelry for all the latest. Rohn Strong has put together a great collection of crochet designs featuring some of our favorite Malabrigo yarns in his new book, Hooked on Malabrigo!. Inspired by the classic color blocking of Mondrian, Rohn has designed 7 different pieces, from accessories to garments, with strong stitch details and striking colors. The deceptively simple color work of the Linda crescent scarf really shows off the shine and drape of the Silky Merino. Malabrigo Arroyo looks light and airy in the Kristin tank, a perfect summer layering piece. 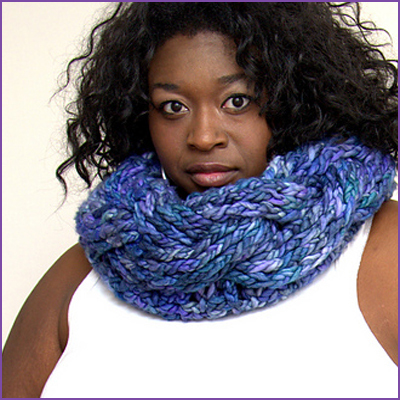 The Robyn cowl features giant crochet cables that really showcase the colors of Rasta. Not only is this collection full of great additions to your wardrobe but it’s available in 2 size ranges; the Petite Collection: Small to XL, or the Plus Size Collection: 2X to 5X! Which piece do you think you’d make first?